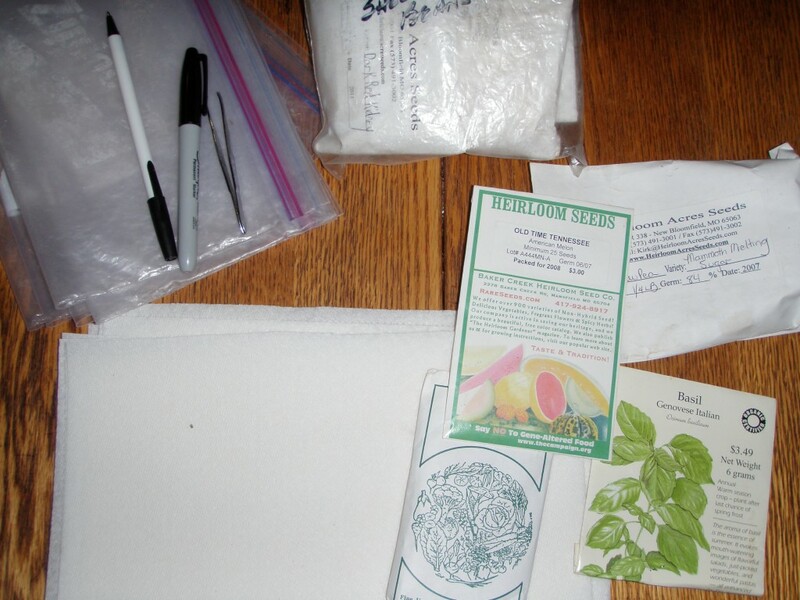 If you are a seed junkie – yep, that’s me – you frequently find yourself with a partially used or even unopened package of seeds. If they are last year’s seeds, I usually just go ahead and plant. Germination for most things (onions are an exception) will probably be fine. If I’m worried about it or think the seeds may have been exposed to moisture or otherwise not stored in the best of conditions I’ll plant a little more thickly. On occasion, however, it’s an important crop and you want to make sure you have enough, or you find a package of unopened seeds that are – well, let’s not put a figure on it because I don’t want to embarrass myself unnecessarily, but let’s just say the seeds have a little age on them. In that case, you may want to consider germination testing. If you really want to have fun, get some help from the five-year-old and seven-year-old who live here. As usual, I keep it simple. 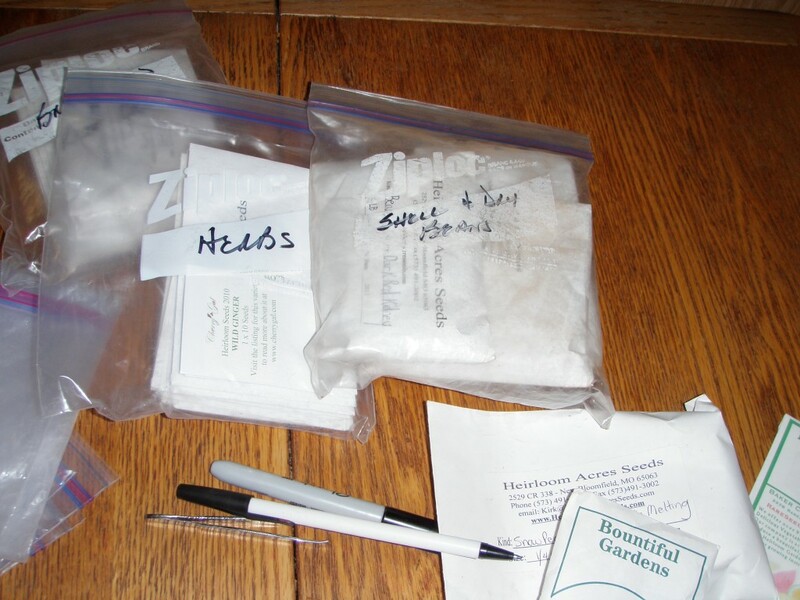 All you need for germination testing are some paper towels, a container of water, plastic bags, a pen to label the seeds and a warm spot. Oh, and the seeds, of course. Ten seeds per variety are enough for a simple germination test, but if you’ve got a limited number of seeds you can use less – it just magnifies the potential to get skewed results. Select good seeds; broken or partial seeds won’t germinate, and a misshapen seed may have a genetic problem. If you have the kind of paper towels that are about twelve inches or more square, cut them in half. Plain white paper towels make it easier to see small seeds. I label the paper towel at one end with a regular ballpoint pen. Ballpoint ink holds up well when wet; markers – even the permanent kind – will bleed, and you can’t write on a paper towel with a pencil. Put the seeds on a dry paper towel at least one inch apart. If they’re tiny, you may want to use tweezers to ensure you only get one seed at a time. 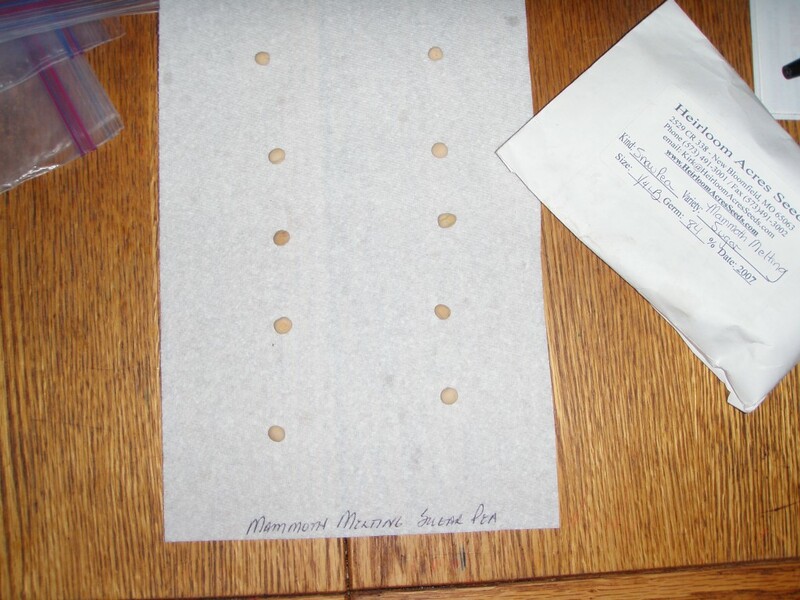 Seal the original seed packet immediately and put it somewhere that you can’t accidently drip or spill water on it. Seeds need moisture to germinate, but you don’t want the towel sopping wet, as the seeds may rot in an overly moist environment. You can dampen the paper towel by sprinkling or spraying it with tepid water or (my preference) use an eyedropper. I put a drop of water on each seed that is big enough to wet the paper towel around it to a circle at least an inch in diameter. For larger seeds – anything the size of a cucumber seed or larger – I put the seeds in my bowl of water for a minute or so. This is particularly important with peas, beans and similar hefty seeds, as they take up quite a bit of water when sprouting. Roll up the paper towel and put it in a ziplock bag. Repeat with a different type of seed. I find I can put about twelve rolls in single layer in each gallon size bag. Gently roll the bag toward the open ziplock end to squeeze out some of the air. Seeds need some air, too, but you don’t want them to dry out. Seal the bag, LABEL the bag and date. That’s assuming you are doing your germ testing over the course of several days when you can fit it in between other chores. If you can do a complete set of tests in a single day, more power to you – it’s not a feat I have been able to accomplish. Tuck the plastic bags away in a nice warm dark place, like the top shelf of a closet or cupboard above eye level. And, ahem – don’t forget to make a note to yourself somewhere in plain sight to check the seeds every couple of days. You don’t want to find last year’s desiccated bean sprouts in with your summer shirts when you get around to cleaning the closet as once happened to someone I know quite well. Every other day is a good check-in schedule; you can add more water if the paper towel has gotten too dry and you can see whether the seeds germinate quickly. If you get quick germination but not much of it, you might want to grow out some of these seeds even if you don’t need them for this year’s crop, just so you can replenish the seeds. If at least half of your seeds germinate, go ahead and plant – just seed more thickly than usual. If less than half germinate, you can try the “plant more thickly” routine, but if it’s a food you use a lot and really need, I’d recommend you buy new seed. Seeds that don’t germinate within ten days usually don’t have enough vigor; sometimes if you wait a few more days they will grow, but those seeds don’t usually do well, in my experience. 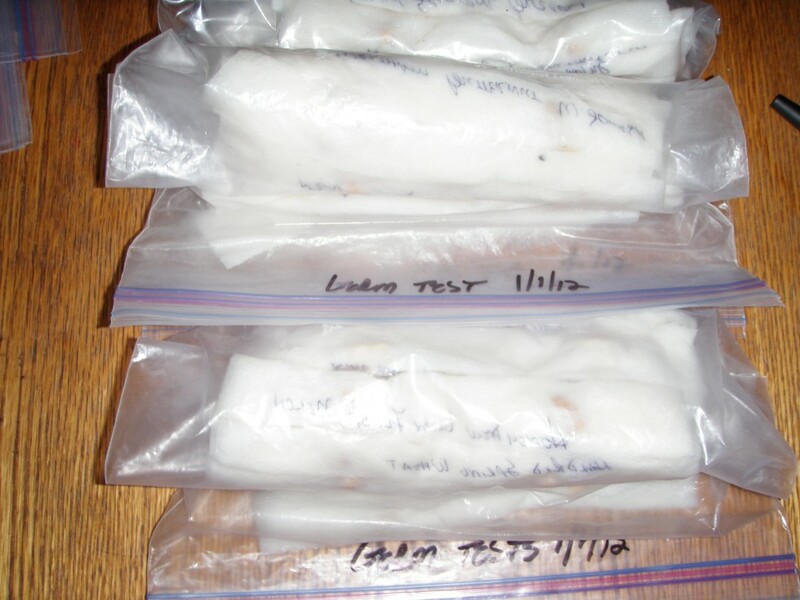 I usually discard the results of the germination tests because I’m doing the testing in the depths of winter (so I can order new seeds in plenty of time for the planting season), but if you are testing just prior to the usual planting period, you can plant the sprouted seeds. Cut the paper towel into squares with a seed in each square and plant the little sprout. Be careful, it’s easy to injure the tiny plant, and don’t try to detach the sprout from the towel for the same reason.